Countries Visited: South Africa, Namibia, Botswana & Zimbabwe. We depart Cape Town and drive north to the spectacular Cederberg region. We spend some time this afternoon learning about what to expect as well as the vehicle and equipment. We travel through Namaqualand and to the Gariep/Orange River. The night is spent getting to know one another over a hearty meal. In the morning we have the opportunity to experience the Gariep/Orange River by canoe, or spend some time relaxing. After lunch we travel north to visit the Ai-Ais Hot Springs and overnight close to the mighty Fish River Canyon. Optional Activities: Half -Day Canoe Adventure. After an early breakfast we take a scenic walk along the rim of the Fish River Canyon. 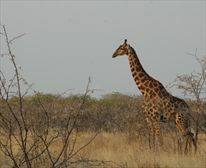 After visiting the canyon we travel further inland to the Kalahari area of Namibia. 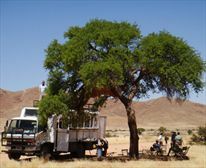 On the way we will visit the Kokerboom (Quiver tree) Forest. This morning those who wish to spend some time with the !Kung tribe will have the chance to do so. Later we drive west towards the massive dunes of Sossusvlei. Optional Activities: African Tribal interaction . 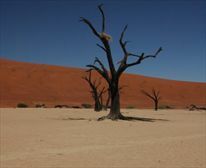 When we enter the Sossusvlei area we are joined by a local expert to learn about the unique desert ecosystem. 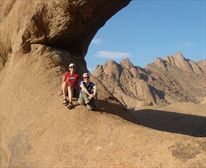 After the tour you can hike up Dune 45 for some photos or take a rest, before an afternoon excursion to the small Sesriem canyon. Today we cross the Tropic of Capricorn on our way through the desert. Our first stop is Walvis Bay where we may see some flamingos. On arrival in Swakopmund you will be briefed on the different optional activities available. Optional Activities: Dinner, Quad biking, Sand boarding, Sky Diving, Scenic Flights etc. Heading inland, we drive north towards Kamanjab where we meet with the local people from this area. The Himba are a pastoral people and predominantly breed cattle or goats. Encountering a totally different way of life can be a moving experience for many people. 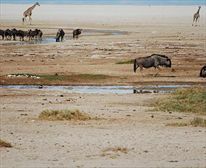 After an early breakfast we enter Etosha NP for some superb game viewing. We will visit water-holes to wait for the animals to come and drink as well as explore as much as we can of the NP. It may sometimes not be possible to overnight in the park due to availability. On our way to Namibia's capital city we stop at a craft market so you can purchase some authentic African creations. Windhoek is situated at almost the exact centre of Namibia. In the afternoon we'll take you on a short tour of the city. Optional Activities: Dinner at Joe's Beer House. We take a scenic drive to the Buitepos border, where we enter Botswana. 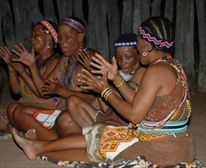 Once at the lodge we meet with a local Bushman community and see some traditional Tribal Dancing. 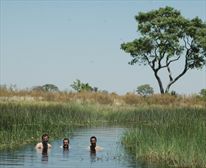 Maun is well known as the gateway to the Okavango Delta. We spend one night in this remote town and prepare for this excursion. Small planes transport us over this amazing area to Gunn's Camp for the next 2 nights. Animals are often spotted from the lodge, but we also take a nature walk and, if the water level allows, a mokoro (traditional canoe) trip. A second scenic air-transfer will return us to Maun and the truck. This afternoon we drive to Gweta where our evening accommodation is unique, and a little quirky. We drive north to Kasane, where we stay on the bank of the Chobe River. We take an afternoon river cruise in order to visit Chobe NP's animals as they come down to the river to drink. After crossing into Zimbabwe we have a short briefing on all the activities available here. 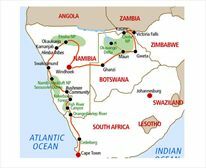 Then we enter the much anticipated Victoria Falls NP where we will experience the might of the great Zambezi River. The popular optional sunset cruise includes dinner and drinks. 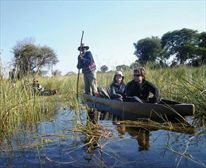 Optional Activities: Chobe Game Drive, Z ambezi Sunset Cruise, dinner in local restaurant. Most people will spend the day white water rafting, a not-to-be-missed experience of a lifetime! Vic Falls offers many exciting alternatives. Optional Activities: White Water Rafting, Bungee Jump, Elephant Excursion and many more. Rate per twin share accommodation. Rate subject to change. Single supplement R2950.